Found a lost dog or cat with a CVMA Rabies Tag or Mile Hi Rabies Tag? Call 303.318.0447 for assistance locating the animal’s veterinarian. CVMA is proud to introduce the CVMA Rabies Tag Program — a statewide, unified rabies identification system. For the past 30 years, this program has sold personalized one-year and three-year rabies tags to veterinary clinics through a unified system in the Denver metro area, managed by the Denver Area Veterinary Medical Society. Now, the program is expanding statewide. 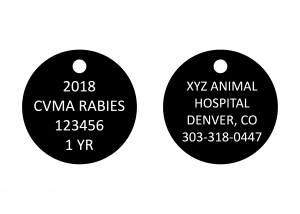 By ordering CVMA rabies tags, you reduce the opportunity for duplicate numbers between different veterinarians across Colorado. Unique rabies tag numbers are critical to helping lost pets find their way home and avoiding frustrating duplicate numbers in your practice’s system. CVMA makes it easy to reorder from year to year. We provide you a summary of your rabies tag order from the prior year, saving you time and headaches when reordering. Plus, the proceeds from all tags sold support CVMA programs, so utilizing the unified system also benefits your professional association. The NASPHV (National Association of State Public Health Veterinarians) recommends veterinarians use the bell shape tag for the 2019 calendar year. CVMA Tags are available in one-year and three-year. All dog tags are the bell shape and all cat tags are circles. The front of each tag will include the year of issue, “CVMA Rabies,” and the ID number. It will also indicate if it is a one-year tag or three-year tag. Dog tags will include the name (practice or veterinarian) and phone number. Cat tags will include the clinic phone number only because of space restrictions. 2019 Rabies Tags Order Form download is coming soon! Regional order forms will be updated as soon as they become available. Please continue to check this page as content will be updated as soon as possible. Please note that CVMA is responsible for collecting various local and state taxes depending on where your practice is located. Please read the descriptions below and select the correct form. Thank you! Select this form if your clinic is in the City & County of Denver. (Denver sales tax is 3.65%, Colorado sales tax is 2.9%, RTD/CD tax is 1.1%). Select this form if your clinic is in the following counties: Adams, Arapahoe, Boulder, Broomfield, Douglas (excluding Castle Rock and Larkspur) and Jefferson. (Colorado sales tax is 2.9%, RTD/CD tax is 1.1%). Select this option if your clinic is outside of Denver or the counties listed above. (Colorado sales tax is 2.9%). **2019 ORDER DEADLINE: The order deadline for 2019 rabies tags is September 28, 2018. For more information or to place your order by phone, call the CVMA office at 303.318.0447. CVMA orders a limited quantity of generic, supplemental tags. These tags are not personalized, but simply list the CVMA phone number for tracking purposes. As supplemental tags are sold, CVMA’s confidential database is updated to show which clinic purchased what rabies tag ID numbers. When someone who has found a lost animal calls the CVMA phone number on the tag, they will be referred to the practice that issued that tag to locate the animal’s owner. 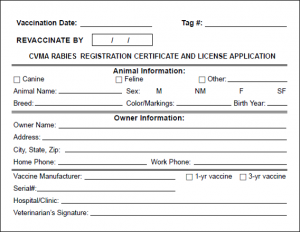 To order rabies certificates, you can use either the 2018 Rabies Tag Order Form / online order form (certificates will arrive in December) or the 2018 Supplemental Rabies Tags Order Form / online order form (certificates will be sent right away). Questions? Prefer to place your order over the phone?